"My Bag Collection" feature is really just about the bags that managed to stay in this whirlwind of buying, trying out and selling. So far I have only featured my Alexa (my first new and bought from Mulberry direct) and my Mini Alexa (with me on every holiday) as these were the only two I was 100% sure would be staying. My Small Bayswater Buckle is a fairly recent addition and I only started using her a couple of weeks ago. And yet, I am pretty sure she's going to stay. How come? I absolutely love her! 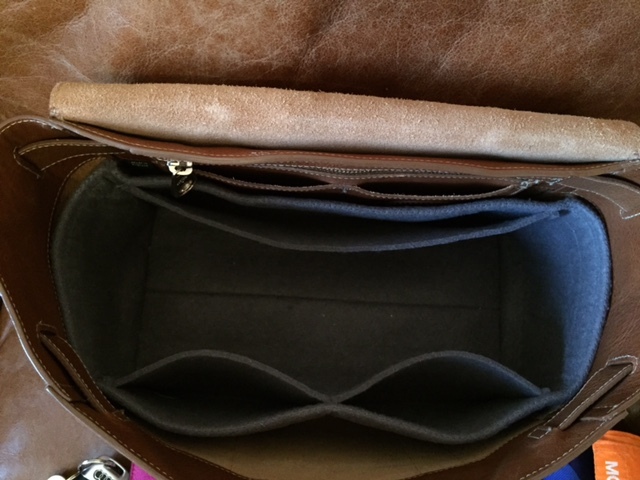 Interior zip and slip pocket, postman lock closure. Relaxed formal, i.e. not as formal as a classic Bayswater but more so than a tote. Quite boxy and therefore roomy. Works well as a workbag (though not really A4 compatible) but also as a cute weekend bag - as long as you don't need a long strap to remain hands free. Mainly for work. She's a perfect size to get all that stuff that I lug to and from work (excluding laptop), more lightweight than my Bayswater and surprisingly easy to carry - despite the short handles. 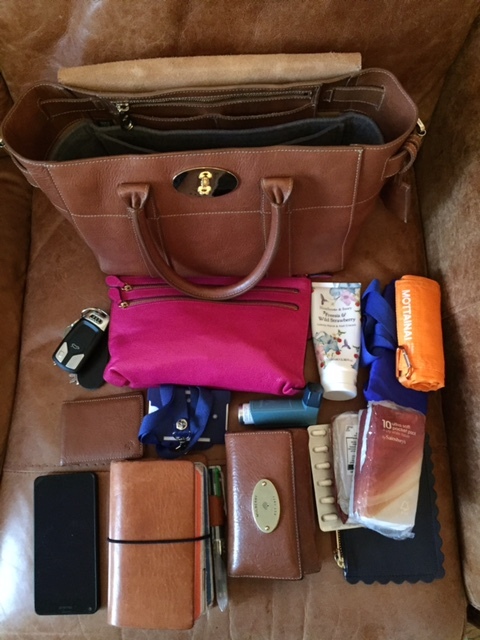 All the following in a Love Lolo liner: Purse, Naked Cow Fauxdori with 4 Fieldnote-sized inserts, Mulberry Multizip Pouch, 2 shopping bags, handcream, inhaler, car keys, phone (normally x 2), tissues, Boden leather pouch, work pass, Mulberry train pass holder. Use Collonil Gel for cleaning and nourishing and finish off with Collonil Waterstop spray to protect. For more info, check out my full video review here. So there you go - an incredibly fast acceptance into my little bag family!